As the story goes, in 1760 François Delamotte, a magistrate, founded Maison Delamotte In Reims, the third Champagne House. Nicholas-Louis, son of François Delamotte, entered into a partnership with Jean-Baptiste Lanson, and In 1837 it was named Lanson and Cie. In stayed family owned until 1980, went through a series of owners, and is now part of the Lanson-BCC group which also owns Champagne Philipponnat as well as other minor Champagne houses, and they also make house label Champagnes for UK supermarkets and others. They concentrated from the beginning, as they do today, on exporting Champagne to foreign markets. They have long been extremely popular in the United Kingdom and is in fact a "purveyor of champagne to the British Royal Family." They are not very well known in the USA as they've been concentrating on other markets. In fact I've only drank a couple of older bottles from the 70s, although I do have some bottles on order and Lanson appear to be entering the US market. Lanson allows no malolactic fermentation, which helps prevent oxidation and makes the wines very long lived. They also traditionally make no prestige cuvees, putting their best fruit into their standard vintage wines. These two practices are just like Bollinger, Krug, and Salon, putting them in phenomenal company! They also age their wines at least 3 years before releasing them. Black Label - 35% Chardonnay, 50% Pinot Noir, 15% Pinot Meunier. Basic entry level wine. Ivory Label - This is their demi-sec cuvee and 35% Chardonnay, 50% Pinot Noir, and15% Pinot Meunier. Lanson Rose Label - This Rose seems very popular in Europe and is 32% Chardonnay, 53% Pinot Noir, 1and 5% Pinot Meunier. Gold Label Brut Milliesime - This is a serious wine and a long ager! About half Pinot and half Chardonnay, aged for 5 years minimum on its lees. I have some 96 (tasting note below) and 2002 coming once in warms up in the Spring and will add tasting notes! Noble Cuvee Vintage, Rose, and Blanc de blancs - These three wines while true to the Lanson style are Chardonnay dominant instead of Pinot Noir as are most Lanson Champagnes. Extra Age Brut and Extra Age Brut Rose - Pinot Noir dominant multivintage blends combining 3 great vintages. 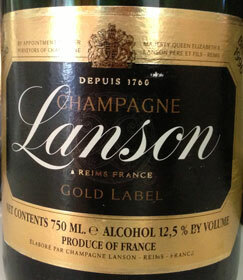 Lanson also has older vintages back to 1976 they occasionally release. This has a deep yellowish orange color. An aristocratic nose with sandalwood, nut skins, apple and orange. The palate is intense. Very rich and appley, spicy apple butter, generous and smooth. Clearly not a young Champagne. Some orange flavors on the edges. Would benefit from food certainly due to the intensity of the flavors. Not my favorite style, and I was surprised that a 1996 was so evolved despite it still being quite intense. Looking forward to trying my next bottle sometime.